"Good morning ladies and gentlemen. On behalf of all the men and women of General Dynamics Quincy Shipbuilding Division. It is my pleasure to welcome you to our shipyard this morning. "Like her sister ships, the 1ST LT JACK LUMMUS has recently completed an exceptionally successful sea trial. Like her sister ships the LUMMUS will carry the materials and equipment necessary to support 3,000 Marines for up to one month under battlefield conditions. Yet, the 1ST LT JACK LUMMUS is a unique vessel. She is proud, strong, and a capable ship, whose construction and performance truly embody the spirit and character of Jack Lummus. "The capture of Iwo Jima was not an easy accomplishment, and required individual and personal sacrifices. That island was not won with assembly line solutions to difficult situations, but required the dedication, commitment, and unique contributions of Jack Lummus, and many of his fallen Marine comrades to enable us to raise our flag over Iwo Jima. In the face of personal uncertainty and peril they did what had to be done for us all. "The ship you see before you, and the men and women who built her also reflect this spirit. 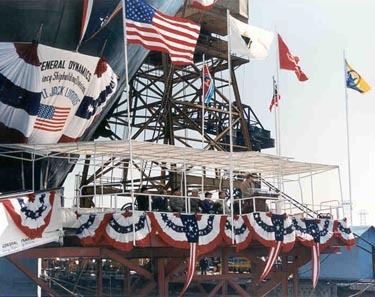 The 1ST LT JACK LUMMUS was not built by a cookie cutter manufacturing process, but required the individual efforts of thousands of Quincy craftsmen whose pride and professionalism put aside their feelings of personal uncertainty, and completed this ship on schedule and within budget. "The LUMMUS is a complex maze of perfectly tuned steel pipe, cable, and machinery, which has taken on life and purpose through the sweat, skill and dedication of each worker in this shipyard. She is a Quincybuilt ship. One who is worthy of the Marines, and 1st Lt. Jack Lummus for whom she will be named. "We are indeed fortunate to have with us today the family and friends of Jack Lummus as well as key members of the Navy and Marine Corps team responsible for carrying out this critical mission. Let me introduce you to some of our distinguished guests: Miss Jacklyn Wright, Maid of Honor and daughter of Mrs. Thomas Wright; Lt. General Joseph Went, Deputy Chief of Staff for Logistics, United States Marine Corps; Jim Mellor, Executive Vice President Marine Business Systems and Corporate Planning General Dynamics Corporation; and our good friend Reverend Joseph Downey from St. Joseph's Church. Finally, it gives me particular pleasure to introduce to all of you the president of the General Dynamics Corporation, Oliver C. Boileau."